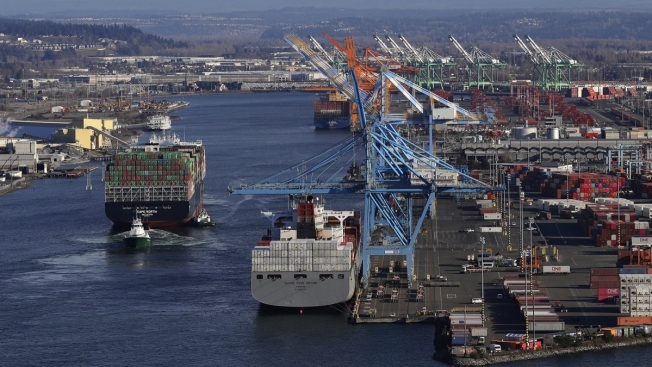 In this Tuesday, March 5, 2019, photo, a container ship at left heads into the Port of Tacoma in Commencement Bay in Tacoma, Washington. The U.S. trade deficit jumped nearly 19 percent in December, pushing the trade imbalance for all of 2018 to widen to a decade-long high of $621 billion. The gap with China on goods widened to an all-time record of $419.2 billion. The Commerce Department figures released Wednesday undermined a key commitment by President Donald Trump, who promised to cut the trade imbalance on the belief that it would bring back overseas factory jobs and bolster the broader U.S. economy. But America's appetite for imports appears to have increased after the tariffs that Trump imposed last year on foreign steel, aluminum and Chinese products. The greater reliance on Chinese imports likely reflects an acceleration in economic growth last year from Trump's debt-funded tax cuts, which were designed to increase spending by consumers and businesses. The gap between what the United States sells and what it buys from other countries rose to $59.8 billion in December from $50.3 billion in November, the Commerce Department said. Adjusted for inflation, December was the highest imbalance on trade goods in U.S. history. Stephen Stanley, chief economist at Amherst Pierpont Securities, suggested that the trade gap climbed so quickly because importers were rushing to bring their goods into the United States before a planned expansion of tariffs Chinese products on January 1. But the tariff hikes have since been postponed as the administration has cited progress in trade talks with China. While strong economic growth helped to fuel a jump in imports, a higher trade gap can also be a drag that worsens the rate of growth. The increased trade gap along with weak home construction figures for December likely means slower economic growth during the final three months of 2018, according to Jim O'Sullivan, chief U.S. economist at High Frequency Economics. O'Sullivan estimated that annualized growth in the October-December quarter will be revised down to 2.4 percent from 2.6 percent. On an annual basis, the trade gap widened 12.5 percent. The trade gap reached the largest total since 2008, when it was $708.7 billion. That imbalance fell in the aftermath of that year's financial crisis as the United States and other nations plunged into severe recessions. December's trade imbalance worsened because U.S. imports rose 2.1 percent as Americans bought more household appliances, cell phones and computer products from abroad. Simultaneously, U.S. exports fell 1.9 percent as foreign demand for civilian aircraft and oil products declined. The U.S. opened fire in a promised trade war against China Friday, raising tariffs on $34 billion worth of Chinese exports. China, in turn, raised tariffs on $34 billion in American imports, including soybeans, pork and electric cars. Trump hit roughly half of Chinese imports with taxes last year, a move designed to kickstart trade negotiations with the goal of increasing exports to that country and stopping the forced turnover of U.S. technology and theft of intellectual property. China retaliated, and the simmering trade war roiled financial markets last year. U.S. and Chinese officials have recently signaled that they're close to some kind of agreement, although China has only bolstered its commitment to investing in and developing its technology sector and questions about how to enforce any trade rules remain. In addition to a record trade gap in goods with China, the imbalance reached new peaks with Mexico ($81.5 billion) and the European Union ($169.3 billion). The United States ran a record surplus last year with South and Central America.